The teaser trailer of one of 2018’s most anticipated movies just dropped. Here is what you need to know. We all collectively lost our wigs Friday night when Marvel released the teaser trailer for the upcoming “Black Panther” flick scheduled to open next February. From the black excellence of actors on display down to the costume details, the two-minute clip was a visual smorgasbord of melanin that left us in a frenzy to get to a movie theater ASAP! The story of one of Marvel’s most enigmatic and underrated characters takes place in Wakanda, the mysterious hyper-advanced African nation where T’Challa — or Black Panther— is set to rule as king. 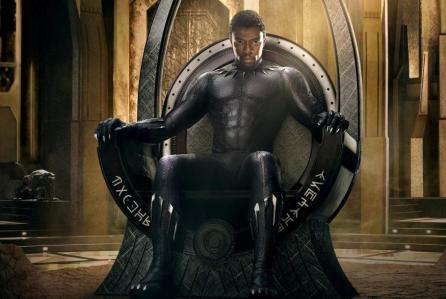 We first meet Chadwick Boseman’s Black Panther—the first black superhero in comic book history—in “Captain America: Civil War.” If you are not familiar with Black Panther lore, the internet has many a rabbit-hole to help you play catchup. And a viewing of recent Marvel films will give you some background. You will want to know everything for this one! The buzz surrounding the movie hit a fever-pitch last summer when the cast was first introduced to the michaelworld during Comic-Con 2016. Alongside Boseman, we learned that Michael B. Jordan will play villain Erik Killmonger; Lupita Nyong’o will play love interest and future enemy Nakia; and Danai Gurira will play Okoye, head of Black Panther’s all-female security team. The teaser trailer also showed us some new surprises like a white-haired regal Angela Bassett as Black Panther’s mother Ramonda. We are here for all of it! Marvel was quick to attach a black director, the critically-acclaimed Ryan Coogler, to bring this franchise story to life. The acclaim of his first film “ Fruitvale Station” and box-office hit of “Creed” made him a sure winner. And by the looks of the trailer, we know he did not disappoint! This Film Is Blackity Black! From infront and behind the camera, Black Panther is proving to be one of the biggest BLACKEST blockbuster fiIms to date. The cast is already a complete spectrum of black excellence. But some of the behind-the-scenes black (women) superstars working with Coogler include the movie’s production designer Hannah Beachler, costume designer Ruth E. Carter and director of photography Rachel Morrison! T’Challa, or Black Panther, is a multi-faceted character. In the decades since he debuted in 1966, his character has “earned a Ph.D. in physics from Oxford, taken on the Ku Klux Klan, murdered vampires in New Orleans, taught school in Harlem and even married X-Men character Storm,” TIME reports. The teaser trailer dropped during Game 4 of the NBA Finals after Marvel had revealed the first poster of the film earlier in the day. And Black Twitter did not hold back the memes and jokes expressing the pure joy of such a film. Some ESSENCE advice: get your tickets early because this movie will be the best Valentine’s Day date option by far. Your bae doesn’t want to hear that it was sold out! Will you be watching Black Panther?